The First? It is unique because it is foreign. If it’s your first show, it should be a real adventure. If it’s your umpteenth overseas trip, you may view it as a drag, or look at it as an opportunity to maintain and expand relationships. The Second? It is the same as doing a show in the United States. The principles of trade shows are universal. There’s a practical understanding to the basics of trade shows – no matter where in the world you exhibit. Of course, there are the cultural nuances you must accept. Knowing where you are going and how to be accepted once there are critical business decisions. In addition, there are universal standards in design, promotion, presentation and follow-up for any trade show. Your appearance and business practices must align to the actualities of the host country, industry and the international marketplace. Are You Going to the Right Show? A show is not just a show. Each exposition has its own personality, and that changes from year to year depending on locale, exhibitors, the health of your industry and how the economy affects your clients. It is important to understand there are three Types of Shows. In the U.S., we tend to separate these show types (1) B2B Marketing, (2) B2B Sales and (3) B2C Marketing/Sales. In many countries, the functions and audiences overlap throughout the show, or on certain days. Align your expectations for each type of show. Consider each show a new show, not a repeat of the previous year. Then ask if your timing is right for entry into that country via that show for your products and services? How do you find the right shows? One obvious way is to ask your clients what shows they think are important. Are You Going to International Trade Shows for the Right Reasons? What are you looking for? There are myriad opportunities to connect with leads, partners, clients, reps, dealers, distributors and agents. The more you understand how business works in that part of the world and within your industry, the more you should network and target your markets prior to leaving. Use the pre-show months to get to know each other and build trust. Americans have a tendency to rush into relationships; our overseas partners may take much more time. Are You Influencing the Right People? For international trade shows, there is great value in spending time and money for pre-show research and promotion. Networking skills are expanded via online research, discussion lists and asking your business associates. Appreciating the pecking order – social and business – and how decisions are really made by your target markets can cut your sales time dramatically. Are You Sending the Right Message at International Trade Shows? We’ve all heard stories of the misguided, arrogant or oblivious foreigner who rubs the hosts wrong. We tend to assume everyone loves us and speaks English. Wrong. Take time to understand the value of promotion in native languages and current cultural vernacular. Use professional translation services – carefully checked so you know what everything says – for all signs, graphics, letters, promotional materials, demonstrations. Hiring local multi-lingual talent is always appreciated for initial and qualifying conversations at the show. Are You Sending the Right People? First impressions are critical so take staff selection seriously for international shows. This is the time to be smart, not stingy. 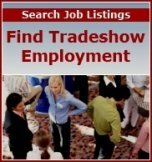 Search your options for the best company representatives. Write a job description and ask for volunteers. Send the people who are competent but also enthusiastic about spreading the word about your company. Maybe you have experienced, savvy in-house staff, or this is the time it makes sense to hire experienced stand staff at the show locale. This most critical part often is lost because there you have no real plan beyond an initial contact or two. Sure, it’s expensive to pursue international business, but today’s technology makes it easier than ever to keep in touch. Ask visitors how they want to be contacted – do they need a local contact or is e-mail preferred? Consider outsourcing initial post-show contact. Are You Getting a Return for Your Investment? Here are some tips for getting the most "bang for the buck:"
Match your expectations for returns with reality of the money you are investing in a show. Understand your sales cycle, delivery times, international shipping options, customs, tariffs and always have a Plan B to be ready for the unexpected at international trade shows. Be truthful about your investment. There are eight key line items of a trade show budget and seven are definite expenses for every show. The exception is that if your exhibit is costly, you may be able to amortize it over a couple of years. These are the major line items you must decide before you can get a good handle on your potential ROI. Is it easy to do international trade shows? No, but it is easier when you understand the parameters of the paradox. This article on international trade shows was written show marketing expert Julia O'Connor, president of Tradeshow Training, Inc.